Diocesan Youth Participate in Music Ministry Alive! BRIDGEPORT—Six young parishioners of All Saints Parish in Bridgeport represented the Diocese of Wheeling-Charleston last month at Music Ministry Alive! (MMA). Pictured are young parishioners of All Saints Parish in Bridgeport who attended Music Ministry Alive! In the front row, from left, are Marissa Bailey, Ashley Roop and Emily Estanich. In the back row, from left, are Christopher Roop, Alex Estanich and Zach McClain. 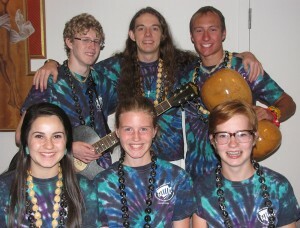 Held annually at St. Catherine University in St. Paul, Minn., in July, MMA is a prayerful and faith-filled event that engages and empowers young people to serve as liturgical music leaders in the church. This year, 149 youth and 55 adults attended the gathering, which was led by composer David Haas and many other composers, theologians and pastoral ministers. MMA participates in the mission of the church by forming and advocating on behalf of young people who have the gifts and desire to serve as musical and liturgical leaders, said Stephen Pishner, director of Music and Liturgy at All Saints. Haas and the many other pastoral musicians and theologians who lead it believe that there is an urgency to mentor and form young people in music ministry with a program that forms young people musically, liturgically, spiritually and in their leadership skills. All Saints parishioners Zach McClain and Marissa Bailey also attended.